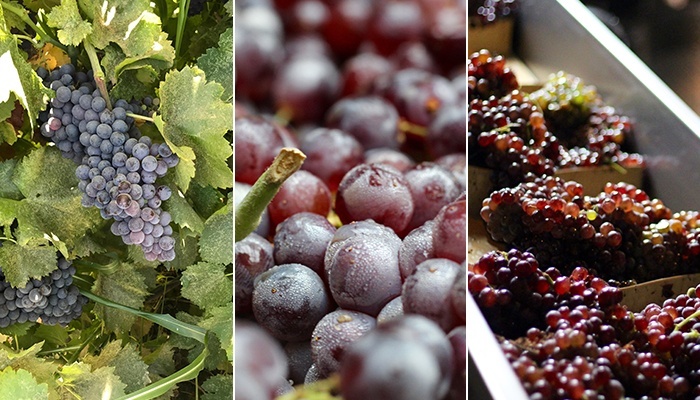 When it comes to winemaking, harvest season is when all the magic happens. It’s simultaneously exciting, exhausting, and a little bit scary. This is especially true at Brooklyn Winery, where we are not only at the mercy of mother nature, but the unpredictability of New York City as well. 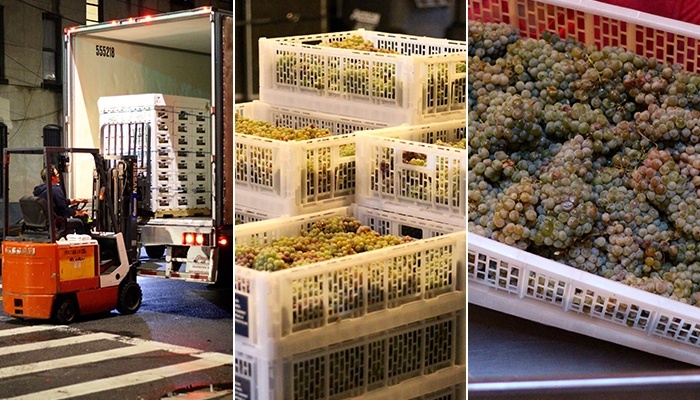 Here in Brooklyn, our harvest season takes place between late August and mid November. Since we don’t have a vineyard of our own, everything begins with the arrival of the grapes. We receive fruit from a variety of distinct growing regions—New York State, both the Finger Lakes and the North Fork of Long Island, as well as the west coast, both California and Washington State. This means there’s a lot of coordination between us, the grape growers, vineyard management, picking crews, and trucking companies before the grapes even start their journey to Brooklyn. Our grapes are hand harvested in the vineyards into small plastic picking lugs that hold approximately 36 pounds of grapes each. The plastic lugs are then stacked onto a pallet and put onto the truck for delivery. All of our trucks are temperature controlled to ensure the grapes arrive fresh and in the same condition that they were picked. For grapes coming from the west coast, a team of truckers drive non-stop for three to four days until they reach our winery in Brooklyn. Once the trucks arrive we unload the pallets right on the streets of Brooklyn, dodging cars and cyclists as we bring the fruit into our facility. As soon as the grapes are inside, the sorting process begins. We hand sort the individual clusters with the aid of an incline conveyor belt, discarding any undesirable clusters. The clusters then pass through our mechanical destemmer where the individual grapes are separated from their stems. The grapes are then transferred to either a T-bin (an open top fermenter for small lots) or a stainless steel tank to await fermentation. Depending on the amount of grapes we receive in a day, the sorting and destemming process can take anywhere from a few short hours to a full 24 hour day to complete. In 2016, we received approximately 130 tons of grapes. In the case of our Dry Rosé, for example, we processed over 20 tons in a single day! One of the most important (though far less glamorous) parts of harvest is sanitation. Winemaking is a messy job, and after a long day of processing grapes our machines are covered in juice, grape skins, and all kinds of grape detritus. All of our machines must be cleaned and sanitized before each use. Anyone who has ever worked a harvest will tell you that it’s 70% sanitation, 30% wine wok. It is vital to keep our equipment and winemaking environment as clean as possible to avoid any bacteria, pesky fruit flies, or unwanted yeast cultures. Grapes turning into wine is what harvest season is all about. The magic ingredient that makes this possible is yeast. Because Brooklyn is not an idyllic countryside teeming with sensuous flora, we must inoculate all our wines with cultivated yeast strains. Our team inoculates each individual lot by hand and monitors the fermentation three times a day, checking the sugar levels and temperature. We also manually perform punch downs and pump overs on our red wine lots three times daily. This is done to re-introduce the grape skins back into the free run juice below that have been pushed to the top of the ferment by CO2 (a byproduct of the fermentation process). This continues until all the sugar has been converted into alcohol and the fermentation is complete, which usually takes anywhere from 10-14 days. Pressing our wine can be one of the messiest jobs of all. Since we’re a relatively small winery, we handle much of the process by hand, including loading our press, bucket by sloppy bucket. When dealing with a larger tank ferment like our Old Vine Zinfandel, we’ll actually have to climb inside the tank and shovel out the grape must. Due to high levels of CO2 inside the tank we must wait until the gas dissipates before we can hop in and get to work. All of our red wines are pressed and pumped into oak barrels to begin the aging process. Pretty soon our production room is stacked high with barrels containing the latest vintage! Harvest is a very busy and exciting time in any winery. Everything that occurs during the fall months greatly affects the finished wine, and it is the actions and creative decisions made during this time that determine whether the wine will turn out to be a stud or a dud. It’s a nerve wracking time of the year where winemakers engage in a standoff with nature. Our dedicated winemaking team is prepared for anything harvest season may throw at us, and rest assured, when the grapes arrive, we will crush them! Plan a visit to our wine bar and reserve tickets to a winery tour & tasting to get a behind-the-scenes look at how our wine is made.